During the course of two wars in Iraq and Afghanistan, the U.S. military has faced challenges in treating wounded soldiers on a scale it hasn’t witnessed since the Vietnam War. In response, the military has succeeded in reducing the mortality rate of soldiers injured in combat through a radical shift in doctrine, procedures and medical technology. 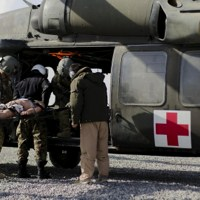 The duration of the two wars has also produced a wealth of research that has informed Tactical Combat Casualty Care (TCCC), which has become the standardized set of procedures used to treat U.S. casualties across active-duty military services. Despite this, the cost has been high: 4,486 U.S. soldiers were killed in Iraq and more than 2,300 killed in Afghanistan. In the early years of the conflicts, the rate of preventable deaths was little different from 30 years prior. But more than a decade later, a wounded soldier is much more likely to survive his or her injuries than in previous wars.